NEW YORK (CNNMoney) -- Facebook has acquired Israel-based Face.com for an undisclosed sum, Face.com confirmed Monday in a post on its blog. 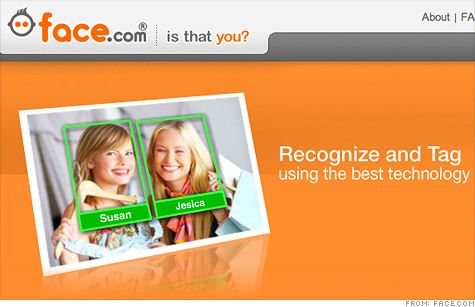 You may not have heard of Face.com, but you've probably seen its technology in action. Launched in 2008, the company powers many Facebook apps that detect and "recognize" faces in photos. Thousands of developers, including Facebook (FB) itself, have built applications using Face.com's online software. Facebook has been rumored for months to be in talks to acquire the company. Financial terms of the deal were not disclosed. "People who use Facebook enjoy sharing photos and memories with their friends, and Face.com's technology has helped to provide the best photo experience," Facebook said in a prepared statement. "This transaction simply brings a world-class team and a long-time technology vendor in house." Facebook is famous for doing "acqui-hires," scooping up talented staff and then shutting down their services, but a source close to Facebook emphasized that Face.com's technology will remain intact. Face.com has provided services to Facebook for two years, so buying the company was a logical move, the source said. Face.com's small development team plans to stay with the company. "By working with Facebook directly, and joining their team, we'll have more opportunities to build amazing products that will be employed by consumers -- that's all we've ever wanted to do," Face.com CEO Gil Hirsch posted on the company's blog. Face.com has long been considered a hot acquisition target, but Hirsch said he was holding out for a "too good to pass up" offer. In December, Hirsch told CNNMoney that Face.com had already turned down several bids: "We think the potential is much bigger," he said. "We're just warming up." But Hirsch's past entrepreneurial adventures taught him to strike when the iron is hot. Before the dot-com bust, Hirsch worked at Xacct Technologies, a corporate software maker that became a casualty of the bubble's burst. Xacct eventually sold for $30 million -- a tenth of the price it was once valued at. "I learned some things after I went through the dot-com bust," Hirsch told CNNMoney. "I learned that if you get a good offer, take it."